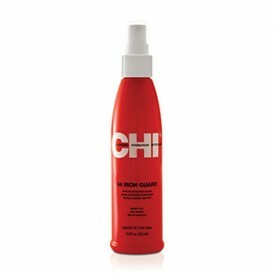 CHI haircare products have ionic and cationic hydration interlink technology. They are infused with a CHI 44 Ceramic thermal styling formula that helps strengthen and protect hair from daily use of thermal tools. CHI Thermal styling allows you to create multiple textures with outstanding style memory that can be regenerated. Positively charged silk molecules interlock into hair's natural structure to build strength and resilience and improve moisture and shine. CHI 44 Iron Guard is a superior thermal protection spray that works from the inside out. It is a weightless formula with no build-up and is ideal for use with all CHI irons and dryers. Suitable for all hair types.